This is the most common type of acupuncture. 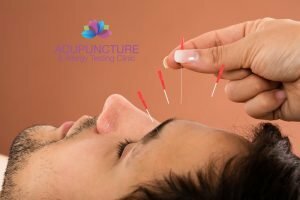 It involves very fine steel needles being inserted into various acupuncture points on the body. Each acupuncture point has a different therapeutic effect. The points are literally all over the body from head to toe. The needles are so fine that very little discomfort is felt when the needle is inserted. This type of acupuncture is used to treat most conditions. Traditional Chinese Medicine believes that there are acupuncture points representing all areas of the body, in the ear. These may be stimulated using very fine, minute steel needles. Tiny press needles or seeds on an adhesive plaster may also be used and in fact, may be left in the ear for up to one week at a time. This method is particularly useful for treating addictions such as smoking or alcohol. It is also used in conjunction with body acupuncture for the treatment of infertility very successfully. This is used in conjunction with Body Acupuncture. It is where an electro acupuncture machine is connected to the top of the Body Acupuncture needles. The needles are then stimulated with an electric current. The patient feels a mild, tingling sensation. This is useful for many conditions but is not suitable for all patients. This is where the acupuncture points are pressed or massaged by the acupuncturist. In the treatment of certain conditions, the therapist may teach the patient to locate one or two key points and teach them how to massage these points themselves. This is particularly useful in painful conditions and especially in the treatment of headaches and morning sickness. This is where small magnets are placed over acupuncture points or are kept in place on the acupuncture point by using elastic bands. These can even be purchased in some pharmacies and are very useful for some patients in the treatment of morning sickness or motion sickness. This is where small amounts of a herb are attached to the top of an acupuncture needle and lighted. The herb will then smoulder slowly and this will have a warming effect on the needle and the area. It is used to treat many conditions especially those of a cold nature from a Chinese Medicine perspective. Heat Lamps are often placed over acupuncture needles. This heats the needle and the heat travels down the needle into the acupuncture point and then has a strong therapeutic effect. Most patients find this a very enjoyable treatment and get great benefit from it. It is especially useful for painful conditions, sports injuries, cold or damp conditions from a Chinese Medicine perspective and a lot of women’s gynaecological problems. involving stagnation of Qi or energy. Oil may be applied to the area and the cups may be dragged or moved and this method is also used for moving stagnation. Ancient Formulas have been established by the Chinese over thousands of years for the treatment of many conditions. These formulas combine different herbs, which come from China and have different treatment properties. Care should be taken when combining Chinese Herbs with Western Medicines. You should seek the guidance of your Chinese Herbalist. Not all medicines and herbs are compatible. Chinese Herbs are, however, invaluable in the treatment of many conditions whether used on their own or in conjunction with acupuncture. All the therapists in our clinics have completed their Chinese Herbal Medicine training and have many years of experience in treating patients with them. This is another part of Traditional Chinese Medicine. It is a vigorous type of massage usually done while the patient is fully clothed! It is a very deep massage and some of the techniques involve vigorous friction. If these movements are performed directly on the skin they can actually cause friction burns. It is particularly useful in treating muscular sports injuries. However, it does treat a wide range of conditions.